As I look out onto the soft blue of Hilo Bay from my Bay front office, I am filled with anticipation and satisfaction at the prospect of serving new cohort of counseling students this fall. The very prospect of reopening the Academy’s doors to face-to-face students has met with enthusiasm and promise. Before advertising, two very qualified candidates have already stepped forward; eager to get head starts on their counseling careers by taking half of the PAHA course work online prior to the September 14, 2014 orientation day. 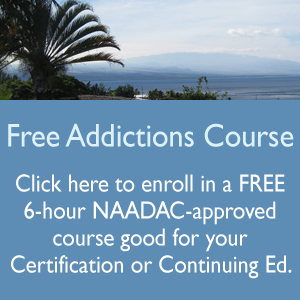 I am now deeply involved in updating and refining the curriculum to reflect changes to the Fifth edition of the Diagnostic and Statistician Manual of mental Disorders (DSM-V), as well as current addictions trends, including the rise of designer drugs and prescription medication abuse, legalization of recreational cannabis in some states, and FDA approval of Naltrexone pens to reverse opiate overdoses. With much to learn and more to teach, I feel humbled to be in a position to make the island of Hawaii a better place. In just a few short months, I will relish the privilege of standing before a group of eager, open minded counseling students; together we will aspire to change the world or, at least, our small island home. Is this class Hawaii approved ? I am starting new face to face classes in May. Please LMK if you are still interested.